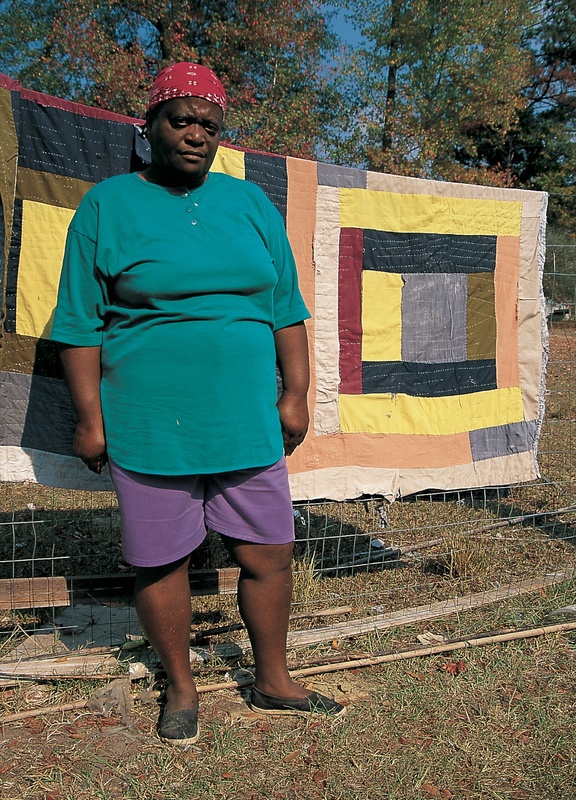 A granddaughter of Delia Bennett (1892–1976), ancestor of many quiltmakers in Gee’s Bend, Mary L. Bennett pieces primarily “Housetop” and “Bricklayer” compositions and imaginative variations of them. I was born down here in Brown Quarters in 1942 and got raised by my grandmother Delia Bennett. My mother was Lucille, Reverend Bennett’s sister. Daddy was Finest Major. I started out working in the fields—I ought to been about ten or eleven—hoeing, picking cotton, pulling corn, stripping millet, digging sweet potatoes, picking squashes and cucumbers, and putting them in the crocus sacks for my uncle Stalling Bennett, my grandmother’s son. He taken all that to sell up to the main canning factory up in Uniontown. I didn’t get no schooling—every now and then a day here and there. After my granddaddy and them died, we didn’t do no more farming. I ain’t did much since then. I still live over in Brown. Didn’t nobody teach me to make quilts. I just learned it by myself, about twelve or thirteen. I was seeing my grandmama piecing it up, and then I start. I just taken me some pieces and put it together, piece them up till they look like I want them to look. That’s all.